How did you become interested in opening a Farmers Market? Call me a bike seat and armchair farmer. While my children were in elementary school, my husband and I bought a bike trip to the Amish country in Lancaster County, PA at a charity auction. Our passion for touring farm and vineyard country by bicycle began. As we biked around Connecticut I became aware of how threatened our local farms are. Land prices are exorbitant, farmers are aging out of the business, their kids are pursuing more lucrative professions, and regulations are stacked against small family farms, and on and on. My family has a strong tradition of participation in environmental causes, so when I came to a period of my life when I felt I could give back to my community with both time and resources, a new farmers market was on a scale I could launch. Farmers don’t have time to market their products, so this was a perfect job for me, their biggest fan. The goal of our non-profit market is to encourage sustainable farming and open spaces by offering farmers a retail outlet for their products. The market also aims to increase the access to and affordability of healthy, CT grown products by bringing these foods into the commercial district of Branford along a public bus route and where there is ample off street parking. The market doubles food stamp dollars (SNAP) and all our farmers are required to accept Farm Market Nutrition Program vouchers (WIC and Senior). The market also donates $500 in market tokens to the Branford Food Pantry each week to provide fresh, healthy food at the pantry the following day and hands out market vouchers at the CT Food Bank’s free food distribution centers in Branford and East Haven. When did you become interested in eating local foods? As we biked to markets we discovered vegetables we hadn’t eaten before and talked to the farmers about new recipes. It is so much more fun to shop knowing that your food dollars are supporting people who are passionate about what they do. Most of the farmers we met had other jobs to support their love for the earth and farming. I find it intolerable that farmers lose money providing us with delicious, safe food! According to the CT department of agriculture, over 65% of farmers in CT lose money. Food, shelter, clothing, and health care are considered necessities. Contractors and real estate brokers turn a profit. Clothing designers and even discount & outlet stores make money. Medical device, pharmaceutical companies, and doctors are entitled to a profit. Why must hard working farmers subsidize our delicious dinners? Americans spend a smaller percentage of their income on food than citizens in Europe and throughout most of the world. Cheap industrial food is making us fat and contributing to multiple chronic diseases. Are there many farmers markets already in Connecticut? 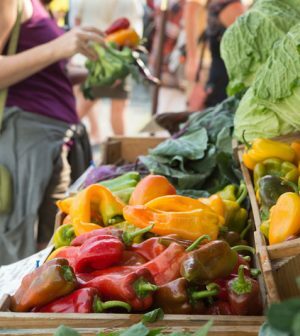 There are more than 200 farmers markets of varying kinds in CT. The department of agriculture reports that the dollars spent at all markets is not growing, so it is important to educate more people about the value of shopping from their local farms as well as to find ways to make food shopping from local sources more convenient and affordable. The less affluent a shopper is, the closer food sources need to be to their homes, children’s schools, health centers, or places of work. How long did it take you to plan and set up the market before you opened in 2015? It took two years to create language defining a farmers market to pass the Branford Planning and Zoning board and then to have the commercial parking lot site approved as the location for a weekly market. What were some unexpected hurdles? Our market is unique in our four town health district. All our products are CT Grown or produced. We offer tasting samples and sell a wide range of foods. The residents who were familiar with farmers markets all had a personal vision of what we were. People assumed we were open on the weekends, for example, but we are an evening market, open from 4-7 pm on Thursdays. Many looked for us on the town green. Others thought we only sold fruits and vegetables, forgetting that raising animals for dairy products, meat, eggs, and even soap is farming too. Still more hadn’t thought about buying seasonal food on a weekly basis. Few shoppers have an understanding of seasonal produce as they are used to buying anything, from a distant region or country, any day of the year. I believe we disappointed many customers on our opening day because we didn’t have local tomatoes and corn. Our vendors offered lush herbs and seedlings, early greens, colorful radishes and sugar snap peas along with cheeses, meats, and breads – enough to fill supper plates all week, but the complaint was that we didn’t have enough food at the market. During the harvest season, September and October, when the tomatoes and corn were plentiful, school had begun and residents fell into their autumn habits, forgetting that our farmers were at their peak production. Our tent was especially festive late in the season, illuminated by twinkly lights. Locating picnic tables under the tent created an intimate atmosphere while musicians continued to serenade customers. Do all farmers markets accept food stamps? Most urban farmers markets accept food stamps and many have incentive programs. Food Stamp incentive programs are rare in suburban markets, although there is food insecurity in these regions as well. The Branford Alps Farmers Market doubles up to $20 of SNAP dollars per customer per market day. A client swipes their EBT card and receives wooden market tokens worth twice what they swiped. How did you find the vendors? Or did the vendors find you? We needed to recruit vendors our first year, primarily by meeting farmers at other markets and contacting vendors on the lists provided by the CT Department of Agriculture. As market manager, I visited each farm to review their farming practices and to assure myself that their products would all come from their own farm. Joining a new market is a major financial gamble for farmers, but they were convinced by our investment in their success. The market provided marketing, a glamorous big top tent, entertainment, a food court with picnic tables, food trucks, and live music. The farmers paid minimal fees and didn’t have to set up their own pop-up tents. They could park directly behind their booths which made it easier to set up their wares. The tent also encouraged a sense of community, a valuable benefit in an isolated profession. The farmers could network amongst themselves as well as educate the public about their farms and products. Vendors have contacted me for the second season, so we are continuing to diversify our offerings. This year we are adding more fruit, mushrooms, and seafood chowders and bisques. Who are the farmers at your market and what do they sell? Do they sell the same things every week? All our farmers have their farms in Connecticut and only sell what they grow or raise on their own farm. As a result our offerings are seasonal. Some of the farmers have hoop houses which help them extend their seasons. They sell vegetables, flowers, fruit, mushrooms, dairy, poultry, and meat. Although not all our farmers have paid for official organic certification, they are concerned about the health of their lands and are moving towards the most sustainable methods they can. All the farmers are comfortable discussing their methods of fertilization and pest control with clients. Other vendors sell CT produced breads and pastries, prepared foods, body care products, and some crafts. Part of the fun of attending farmers markets during the course of the summer and fall is learning to eat with the seasons. How was Thursday afternoon chosen as the best time to have a market in Branford? Many of our farmers sell at a variety of markets and we wanted to respect their existing commitments. Thursday evening has the advantage of attracting people who have 9 to 5 jobs and want to pick up food for the weekend and beyond. Families can come and be fed and entertained during the afternoon snack or dinner hours. This year we are partnering with the Guilford Art Center to provide a craft program for children during the market hours. Farmers markets are an ideal way for kids to experiment with new foods in a welcoming, interactive environment. Why aren’t all the vendors at your market food vendors? Many farmers markets in Connecticut provide a retail opportunity for craft and body care entrepreneurs. Farmers markets are a low budget way for small businesses to test new products before launching a web or store front presence. Our tent accommodates about sixteen vendors and must be full to provide a festive atmosphere. We host only five vegetable farmers, plus poultry, meat, eggs, cheese, mushroom, bread and pastries, prepared foods, beverages, and flower vendors. As we work with the health department and recruit a greater variety of CT produced food vendors, we will have fewer nonfood booths. What kind of craft vendors have been at your market? Our vendors sell jewelry, body care products, ceramics, textiles, pet accessories and more. We discovered that inexpensive jewelry, body care products, and items related to food (aprons, placemats, etc…) sold the best. As the weather got chillier, mittens and hats were a success. The market never hosted more than one craft and one body care booth on any given market day. What non-profit organizations have had booths? Each week the market offered a booth to a local non-profit for them to bring awareness of their mission to the public. Everyone from the Community Garden to the animal shelter to the public library to the local walking and biking trail associations to hunger awareness groups, took advantage of our offer. Why did you want food trucks at the market? Convenience is everything in today’s society. Everyone multitasks. Providing prepared food as well as fresh farm products at the market makes a Thursday evening shop both a quick weeknight supper and a way to plan for a healthy home cooked meal on the weekend. If kids help select ingredients, they are more likely to want to help with the preparation and to eat the meal. How is the market in 2016 different from the market last year? Our food vendors are more diverse and we will have more food sampling to make the shopping experience more interactive. The craft program with the Guilford Art Center is more developed. The market will continue to experiment with ways to reach more clients with food assistance needs. I will distribute market vouchers at CT Food Bank free food distributions centers, for example. There will be also be a rewards program for “Frequent Farmer” shoppers at the market. Do you have any future dreams for this market? I dream that families will shop and cook together. Our families and our land will be healthier. What are some recipes that you like making with the food you buy from your market? Last year I learned to roast chicken in my crock pot. The variety of colorful peppers available at the market are beautiful simply roasted or tossed in a pan with a bit of olive oil until hot. Some like them hot and some like them sweet. I kept meaning to take photos of our dinners, but they looked so tasty that they were half consumed before I thought of taking a picture. Many of my favorite meals are what I call “shop and chop”. Stir some homemade pesto or herbs into your favorite homemade dressing, add eggs or cheese for protein, a slice of sourdough or sprouted grain bread with pasture raised butter and cinnamon, and presto, a delicious meal! A seasonal fruit with with fresh cream or cheese is an ideal dessert. Where can people find more information? Do you have a website? Facebook? Twitter? Instagram? Branford Alps Farmers Market has a Facebook page and Instagram account.